a) A big fuzzy cuddly bear which is reminiscent of Big Foot but misunderstood by society because of its size? b) A terrifying, vicious troll like creature which lives under your bed apparently? c) The inner turmoil one carries inside themself eventually becoming inexpressible? Why else do you think we get monster sundaes and monster cupcakes? Kitchen sink cookies – Eww, gross what do you put in there, dishwashing liquid and steel wool? Topped with lasagne from two nights ago? I start off with this recipe from my very reliable source Brown Eyed Baker. 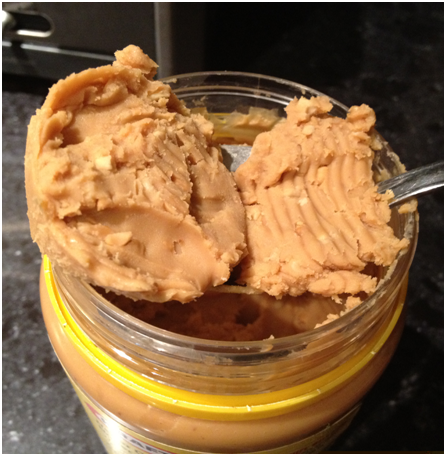 It is the simple staple delicious version with candy, peanut butter and oats. Yum. But so totally done. Told you I have one cookie for every occasion! I have never once chopped onions without crying – what is the secret??!!! I do not know how to catch a train on my own as I learnt yesterday 😛 – I am a bus girl! If there was one thing in the world I would want to get rid of, it would be mushrooms… ew. I love all the variations, and would need Monster sized pants after making them! Oh. My. Gosh. These monster cookies look AWESOME. I just ate, and you made me hungry again! Loving it! Have a great upcoming weekend my friend! These monster cookies are amazing with so many hands on ingredients going into it. wow…these are perfect for every occassion!! You’re so cute, I always smile when reading your posts!! Congrats on your award – definitely so well deserved!! And aww thank you so much – I love making people smile! I just might need that Nutella monster cookie. Are you kidding me? Wow! Thank you so much my sweet dear girl!!!! I have been out of town and recovering from too much fun in New Orleans and have just learned of my award. I am so so thrilled so thank you so much! Congrats to you as well, you know I believe you deserve it. Love your monstrous post…….as always! Thanks again, I will get this posted very soon! It was my pleasure to give to you and congrats from me! Goodness gracious! I think you’re trying to kill us all with sugar, these cookies all look so amazing. 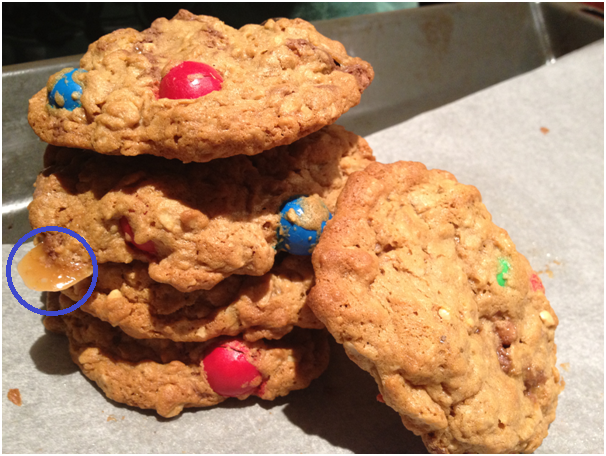 Peanut M&Ms are one of my favorite guilty pleasures…how come I never thought to put them in cookies?? Duh (smacking my head with the palm of my hand)! Thanks for another awesome sweet tooth indulgence! Good thing you will remember them now hiding away in your pantry! 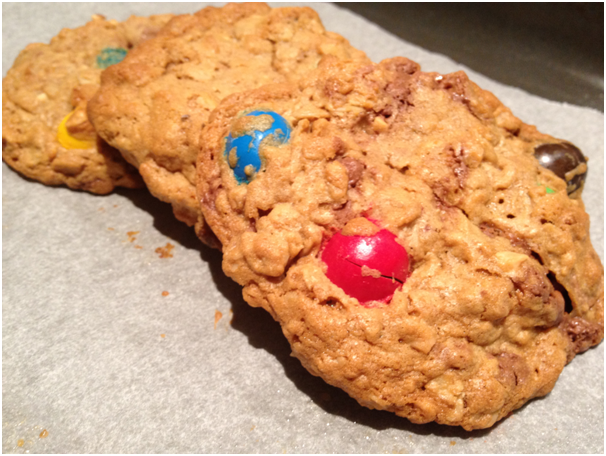 We need to try our own version of the monster cookie. It has just about everything thrown in it, so it has to be one that almost anyone would love. You can’t go wrong there. Mmmmm…cookies. Thank goodness you picked D. I’d have been disappointed if you’d hadn’t gone with cookies. Do you have any cookie recipe suggestions that involve chocolate, coconut, and caramel? You know…the 3 Cs. 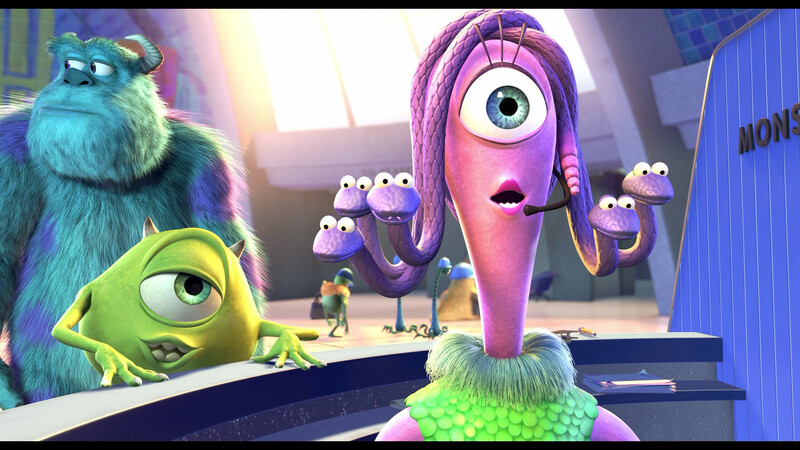 LOVE Monsters Inc…well actually any PIx Movie! The great thing about these types of cookies is that you can have so many variations — look at what you have and go for it! Thank you for reminding us of this fact. Thank you for enjoying each one! And all my winners are definitely deserving! Nothing better than monster cookies, especially if you’ve had a bad day or you’re bored and hungry. And cookies are the best key! What cute monsters you have in you world. I think I am going to adopt a few. Thanks for the Versatile Blogger award. You have made my day. And you are most welcome and deserving my friend – congrats! Popcorn in cookies?! This could easily be a new favorite! 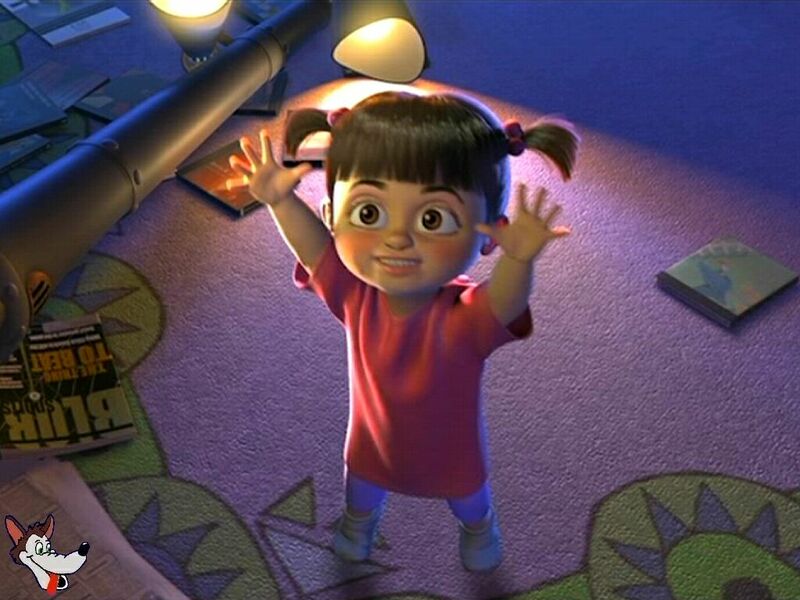 I just love M & Ms in cookies…and I absolutely love Monsters Inc. Boo is so adorable and reminds me of my daughter. So, this post makes me smile. 😀 Thank you so much for the award. You are so kind to me. I so appreciate it. Thanks so much for your lovely comments @ Shirley’s Luxury Haven! Wow, what a monstrous blog you’ve got here! Awesome! Thank you my friend and I would love to keep up a good blogger friendship! Oh my gosh, this is such a delightful post!!! Did you guess that I answered “D”? I’m feeling my waist growing by the inch, so I had to choose D for sure! Lots of great recipes and combinations!! Thanks for sharing!!! I am so happy you enjoyed this post and variations my friend! These. Look. Awesome. Now all I want is a monster cookie!! You always have some fun and delicious stuff to share! These cookies are just terrific with all decadent ingredients! And thank you for your very kind comments on my blog, still very new to the blogging scene but loving it! It was my pleasure to go to your blog, totally fantastic! And welcome to the wonderful world of blogging! I am always happy you enjoy my posts! “Step Away from the Remote Cookies” sound fabulous, i really need to incorporate popcorn into one of my cookies next time! Congrats on the award and I love all of your variations of the Monster cookies…much better of a name then kitchen sink…agree-it sounds gross! And popcorn in cookies (especially caramel popcorn) is a favouritw! You have such a creative mind in writing your posts, never mind the wonderfully creative treats you make! Hmmmm…I tried to post a comment, but it didn’t show up…. And these monstrous cookies look delectable. I love addition of the chips for crunch and salt! Thanks for the award! I’m so bad at these but I’ll make an extra effort this time to complete it! L ove these monstrous cookies. The sweet with the salty chips sounds fabulous. 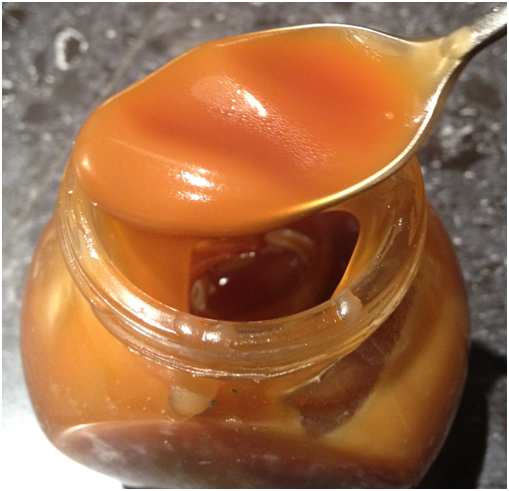 And I do too – is caramel not the best in the world? Congratulations with yet another award! You deserved it. About those cookies: Damn, girl! These are some bonkers cookies! I’m afraid I’ll turn into a 500 kg monster when I start baking those… I don’t share my cookies. Especially not when they’re looking like this. Hmmmm…. These cookies look sooo delicious and they have a little bit of everything so that everyone can be happy. How could a person resist one or two of these? Yum!! Congrats on the award and congrats to all your nominees. 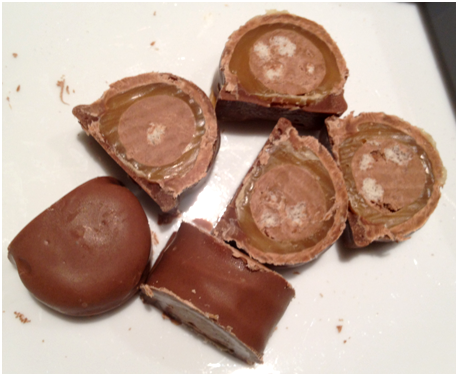 Thank you so much my friend pn both counts – I am very glad you enjoyed them and the post! I think the name monster cookies is very apt! Lots of goodies in them cookies. Congratulations on the award! I too cry when cutting onions – BIT TIME and have found the ONLY thing that helps is to keep your onions in the fridge and cut them while they are cold. Hope it helps. And thanks for the handy tip – tears begone! with monster cookies, you simply can’t lose! 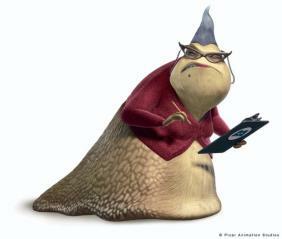 i loved monsters inc and i’m loving every batch of cookies you made! Haha I totally agree – no matter what you do it always turns out right 😀 Yay! gosh these cookies loook deadly! i wouldnt mind some now with a glass of fresh milk!!! Oh my heavens! Those cookies are Monstrously awesome! Congrats on the award. I loved learning a bit about you since we just “met.” I wish I knew the secret of onions and crying. Has any one mentioned putting them in the freezer for a while? You’re so monstrously awesome! Haha and I love the concept of ‘blogger buddies’ – it rocks! Oh my, I would become a cookie monster while eating these monsters. Thank you for the recipe, I’m going to make a lot of people happy with these! And hope you friends and family do too! Congratulations on your award! All of these scenarios wicked, and look monsterously good! Love your horror talk 😉 Nice one! First of all Congratulations on receiving the awards, my friend!You totally deserve it!You never fail to impress me with your amazing love for baking at such a young age and that too by being so so creative with your cookies and desserts,Especially to someone like me who’s still learning to bake properly! Im in a chocolate mood today. You have inspired me to no end! Thanks for visiting and I hope you enjoy your chocolate day! I have not actually seen it for a while now but the concept is so cute! These are the cookies of all cookies. They look fantastic. I would be sure to eat them all up. I like your kind of monsters. 🙂 I’ll have one of your staple version, please! Thanks for visiting my blog! Glad you enjoyed them my friend and it was my pleasure to visit your fabulous blog! Ohmygod! Too much of goody-ness! Wow I’d be dieting for weeks with all these cookies–but really happy first! Congratulations on a well deserved award. It is nice getting to know you. looks really yumm.n nice tempting colour……Thanx 4 this recipe..
Oh you are so incredibly creative with all of these cookie variations. Congratulations on your much deserved award. Your joy of baking comes though in every post and never fails to inspire me! You have a wonderful way of sharing your enthusiasm with your readers and this is always such a fun place to visit. I am truly touched that you enjoy my writing so much and that I am able to get you excited about baking and good food! And isnt monsters inc so cheesy but gorgeous! Hope you too have a fab weekend! Latest: Walk This Way or “Wok Dish Way”? Thanks for enjoying my cookies! 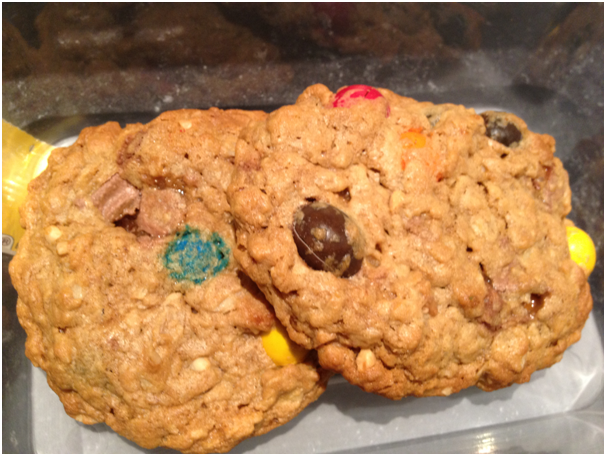 Caramel, pb, chocolate, oats… that’s a heaven-sent mixture if ever I saw one – and giant cookies?? Yes please! Holy cow these look decadent! I love them, and I love all the variations you listed! Congrats on the Versatile blog award and thats nice receiving these awards. I am loving the story on the monsters and that monster, ooops!!! I mean the large cookies with the colorful M&M. 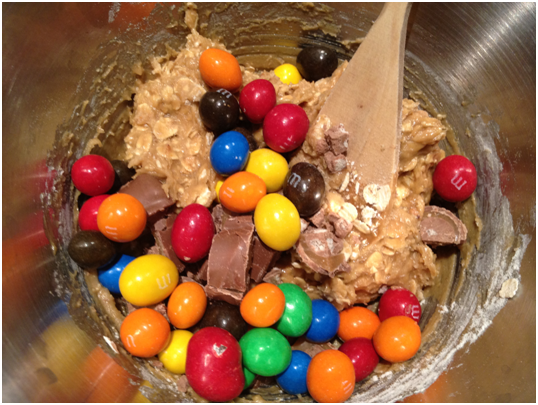 You are tempting me with another recipe of using M&M into baking. 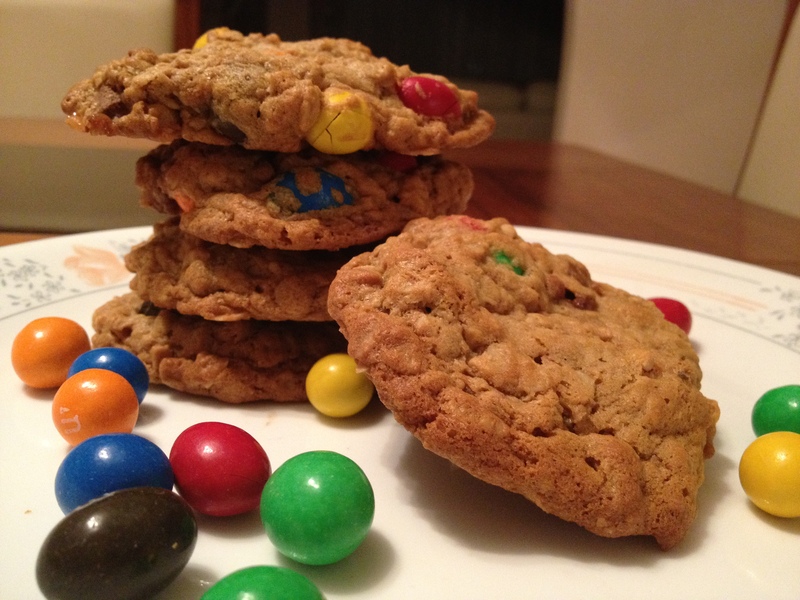 I am going to try one but something very simple and easy and yes, thanks for this wonderful recipe with the colorful M&M. Fabulous looking cookie…I know a few Cookie Monsters that would love these! Kitchen sink cookies are always a way to clean out all those extra hand fulls of candies and chips in the fridge. I love all the variety you suggested here! Congrats on the award and have an awesome weekend! And I am very happy you liked all the different cookie types! Hope you too have a relaxing weekend! Yep..I would choose a cookie 😀 and possibly one monster would be enough.. 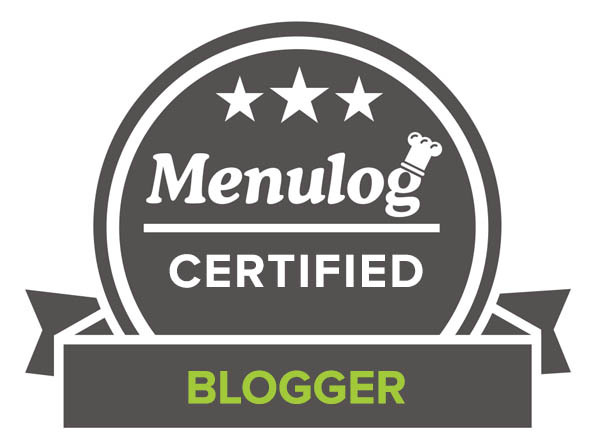 Thank you for the Versatile Blogger Award and all of the monster cookie variations — this was quite a post! And congratulations on your own award and your immense creativity and versatility with sweet things. And congratulations to you – it is much deserved! Yum seriously tempting to go out and buy all those ingredients to make these! All of these cookie recipes are fabulous! Now I’m craving cookies! OOhh!! Thanks for the trip down memory lane with the Monsters, Inc memories. I loved watching that movie with my kids! And the description “monster” is apt for the beauties. Congrats on the well deserved award as well, and i”m with you on the pretzel m&m’s… blech. Mushrooms though, I have an issue with that, though I didn’t like them at your age either and my mom insisted on putting them in nearly everything. Now I love them! Thanks for your wonderful comments. I love thinking of you on the other side of the world! Have a wonderful weekend my friend and have lots of fun! Hope you too have a fun weekend! Congrats on your blog award! Well deserved 🙂 I’d like to order a dozen of those cookies – lol! You are so right, these are monster cookies, awesome! All the different versions are so fully loaded, I want them all! Oh man I want to try each version but have to say the M&M’s anc caramel chocolate candies in a MONSTER cookie sound too good to be true. Great post, love your sense of humor. Have a great weekend and happy baking! Have a wonderful food filled weekend my friend! Hope you too have a wonderful fun weekend! Monster sounds scary! And these are scary, doll! They’re AMAZING! I like how you have all of the different versions! Those cookies look monsterously amazing!! Thank you for the award! I’m monstrously hungry and that first version wins my pick! You are so inventive.. if I could bake like you, I’d be in real trouble;) in not being able to resist several of those!! I call them kitchen sink cookies. 😛 Gross, I know, but also so fun! 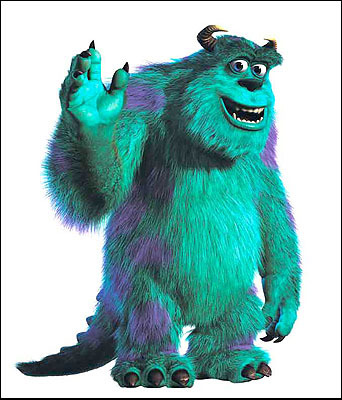 And blogging makes me think of green monsters whenever I hear ‘monster’ now. I know, blogger problems. Awww, thanks so much!! And to be attached to a Monster Cookie recipe makes me twice as happy! Have a wonderful weekend! 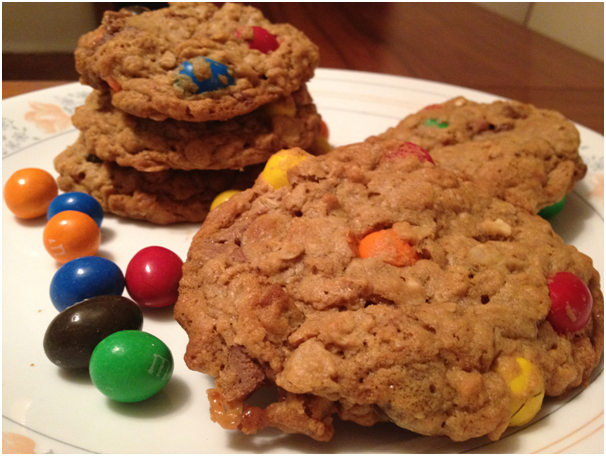 Cookies with M&M’s and caramel? I think I just squealed! Congrats on the blog award. I never knew about pretzel M&M’s until now. Are you in the UK since you say ‘caster’ sugar and golden syrup instead of corn? And no rush my friend! Those cookies look absolutely yummy! Congrats on the Versatile Blogger award! 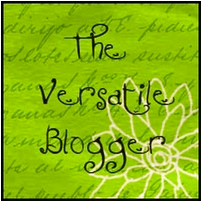 Also, many thanks for nominating me for the Versatile Blogger Award — much appreciated. It’s a joy reading your blog and I’ll have fun passing it along with a link to YOU! Thanks again! How exciting! Thank you so much for the kind mention and award. I appreciate it so much! Congratulations on your own award, as well.